I thought CAR was going to win this one, and they came pretty close despite Newton’s 3 interceptions. That’s what did in CAR. On net, Newton had both positive WPA and EPA. It’s just that Ryan had a great game with +0.55 WPA and +14.4 EPA. Turner had a good day too, with +0.12 WPA and +3.2 EPA on 139 rushing yards at a 5.1 YPC clip. CAR’s defense is atrocious—last in EPA, WPA, and bottom 10 in SR. I’m still not very high on Atlanta. They got a bonus TD at the end of the game, but it was really a 7-point win over a weak team at home. Dalton looks to be on the right track--+0.41 WPA, +14.5 EPA, 78% comp pct, an 8.3 AYPA, no sacks and no ints. A lot of the credit goes to the Bengal’s o-line: 1 QB hit, no sacks, no tackles for losses for +0.13 WPA and +5.0 EPA. So far this season, he’s helped CIN get to a 4-2 record with +5.8 EPA and a 62.4% comp pct. IND was actually in the game until Garcon’s fumble. Carlos Dunlap had the play of the game returning the fumble for a TD. He totaled +0.29 WPA. The CIN defense looks more than credible, totaling -5.2 EPA, -0.88 WPA, and 57.4% SR--ranking 8th, 1st, and 4th respectively. Dalton will probably improve as the season goes on. Keep your eye on the Bengals. All the attention is on the post-game handshake, but it should be on the two defenses. Both Smith and Stafford had poor games. Smith was -0.26 WPA, -14.4 EPA with only a 27.8% SR! Stafford’s day was only slightly better, with a -0.20 WPA, -5.1 EPA, and 41.9%. Frank Gore had a big day with 141 rushing yds for 9.4 YPC. Still, his SR was poor—33%. The reason SF pulled off the upset was Ginn’s punt return for 40 yds and Smith’s go-ahead 4th down TD pass to Walker for the win, which was the biggest play of the day. DET had a 19% chance of winning with almost 2 minutes to go after that play, but couldn’t put together a drive. SF should have gone for it on 4th and 4 from the 19 in the 4th qtr. Instead they attempted a FG, which turned out be good, making it a 6-point game. A conversion ends the game then and there. Even a successful FG still gave DET a chance at a game-winning TD drive. SF also made a mistake by punting on 4th and 1 on their own 49. They were down by 4 with 11 min to play. I’m surprised GB didn’t win by more. Success Rate really likes NYG. Just like last year, they lead the league in SR stats, adjusted for opponent. SR is a good predictive stat. NYG is 10th in offensive EPA and 12th in defensive EPA, so the problem is that they’re not winning the battle of big plays. Despite leading the league in the regular season in 2010, they failed to make the playoffs. NYG is 4-2 now, leading of the NFC East. 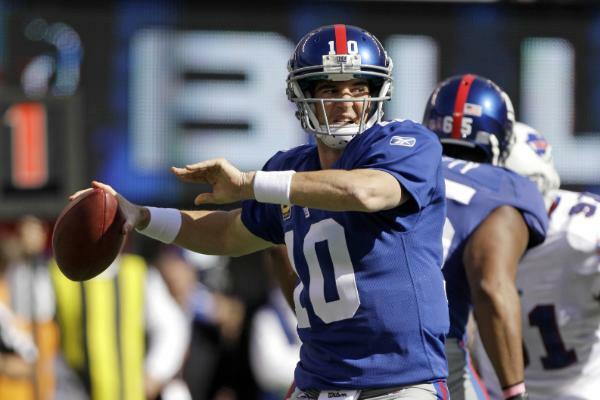 Eli had a huge game +0.62 WPA, +17.8 EPA (both top for the week so far). Fitzpatrick’s 2 ints were the difference in the game. The Giant’s o-line can take some credit for Eli’s day—no sacks, 1 QB hit, and only 1 tackle for a loss. Bradshaw also had a big day with 3 TDs and +0.18 WPA. Corey Webster was the defensive MVP with 2 ints. His second in the 4th qtr was a game-changer. With the score tied, BUF was driving and had a 0.77 WP. Webster stole the ball at the NYG 4. From there, Manning put a game-winning FG drive together. This was a weird one. It looked like PIT was going to stomp all over JAX, but they let them hang around until the end. Gabbert struggled all day with a 2.5 AYPA, but no interceptions. I’m not sure if that’s good or bad. That’s 2.5 net YPA without any -45 yard interception penalties. Both Roethlisberger (+0.32 WPA) and Mendenhall (+0.12 WPA) had solid games. PIT won the battle in the trenches with +0.1 EPA compared to -1.7 EPA for JAX. PIT better hope Polamalu is going to be ok. Without him, it’s a different defense. Just like always, he’s near the top of the NFL in both +WPA and +EPA. PIT’s defense can survive without James Harrison. As expected, you can count on PIT and BAL to battle all year for the AFC North. PHI righted their ship, and WAS’s offense was exposed. Is the national capital's long Grossman nightmare over? In 3 qtrs of play, Rex was good for -2.0 AYPA, -0.13 WPA, -8.6 EPA and 4 interceptions. (That's really bad.) His stand-in, John Beck, had +6.7 EPA and 6.9 AYPA with no ints, but it wasn’t enough to complete the comeback. WAS’s o-line allowed 9 QB hits and could only get 27% run SR.
Flacco had an int and a fumble lost, but still had very good numbers--+0.43 WPA and +7.2 EPA, 55% SR, and 7.0 AYPA. His deep ball kept him in positive territory for the day, hitting Boldin and Smith for big gains to take the lead. Rice had a good day with 101 total rushing yds and 60 receiving yards, including a game clinching run. HOU suffered from the absence of their 2 biggest stars—A. Johnson and M.Williams. Schaub struggled against a rejuvenated BAL defense, which is leading the league in nearly every category: WPA, EPA, and SR. Ageless Ray Lewis led all defenders with 10 success plays. Welcome to the Kyle Boller era, Raiders fans. Campbell’s injury is going to be costly. Better hope your defense is one of the best in NFL history, otherwise forget about the playoffs. Boller hung in there Sunday, but all the signs of his incompetence are there -0.01 WPA, +1.7 EPA (which is below average this season considering all the passing), 2 sacks, and a woeful 36% SR. McCoy had a worse day, with -0.30 WPA, -1.9 EPA, and a 41% SR. Sunday, Hillis posted 2.3 YPC, -0.04 WPA, 01.4 EPA, 37.5% on just 6 carries. Hillis is not making any kind of impact this season. For the year he’s posted -0.09 WPA/G, -0.10 EPA/Play, and 3.5 YPC. Last season he had +0.04 WPA/G, +0.03 EPA/P, and 4.4 YPC. He’s still probably CLE’s best option. CLE has a good o-line, ranked 1st in the league according to –EPA. Only 6 sacks, 34 sk yds, 21 QB hits, and 12 tackles for a loss all season. This game unfolded just how the numbers expected. It came down to the final drive and NE edged out DAL for the home win. Brady was frustrated most of the game but came through in the clutch. He had very high WPA (+0.59) but mediocre EPA (+3.2). Just like every week, the NE offense posts sky-high SR: Brady had 57%, Green-Ellis had 50%, Woodhead and Ridley both had over 60%. Welker didn’t have his usual day, averaging only 4.5 yds per target. DAL LB Sean Lee is a monster. The 2nd-year player lead his squad again with 0.35 +WPA, 6.0 +EPA, a 1.5 Tackle Factor, and 5 success plays, including an interception. Lee is leading all LBs in many defensive categories this year. Keep your eye on him. NE got lucky at the end. It was an error to punt on 4th and 4 on their own 28 down by 3 with 3:36 to play. Had DAL converted a 1st down the game would have ended differently (according to Jerry Jones). DAL ran 3 times for zero yards including a false start against one of the league's weakest defenses, and gave Brady all the time he needed for the clutch drive. NE's punt on 4th and 5 from the DAL 39 at the end of the 3rd quarter was also a head-scratcher. Brees’ 3 Ints was the difference in this game. Freeman had a good day with +0.35 WPA, +8.5 WPA, no ints, and 7.4 AYPA. Their running game was working, with a 46% run SR. NO could not get a running game going, ending the day with just a 35% run SR. Despite the win over a quality opponent, I still don’t think TB is a very good team. They got lucky Sunday. You can’t count on Brees throwing 3 ints every Sunday. NO’s 4th and goal decision was the right call—a slam dunk. To kick a FG there would have cost them 0.17 WPA. The only thing I would have done different is run the ball instead of pass. Even if you don’t make it, you back TB that much closer to their own goal line, which is a dicey place to be when up by 6 at the end of a game. There was 3:24 to play and NO had 2 time outs. TB can’t risk a turnover, and a punt gives NO the ball in great field position. The interception for a touchback was far more costly than people realize because it gave TB breathing room on their own 20. An incompletion or short run would have been so much better for NO. TB got aggressive and converted a couple 1st downs to seal the win. That’s 2 weeks in a row Raheem Morris shown his fangs in the 4-minute drill. A blowout. I guess the Shanahans were right about McNabb in Washington when they benched and then cut (traded) him. Down by 16 points early in the 2nd qtr, MIN attempts a FG on 4th and 2 from the 18. Way to go. You deserve to lose, MIN. Hester returns another kick for a TD, plus scores a receiving TD. He deserves serious consideration for the Hall. Dan - I might be confusing the game/drive, but I believe the announcers mentioned that it looked like the Pats had a fake punt called, but called a timeout and changed it because they didn't like the personnel grouping Dallas had put in. The hidden plays from the BUF-NYG were (1) Manningham losing control of the football in the end zone in the 3rd quarter, and (2) Bradshaw getting stuffed for a 4 yard loss with 1:40 left to play. The dropped TD was compounded by a blocked FG attempt two plays later, and really doesn't need further explanation. The Bradshaw play came on 2nd-and-1 - if he converts, or gets stuffed for no gain, I suspect Buffalo's WP goes way down. The worst possible outcome would have been Bradshaw getting stuffed on 2nd, burning the timeout, then converting on 3rd down, which would effectively end the game. Instead, by dropping him for a loss, they put the Giants in a 3rd and long and stopped the clock on an incomplete pass. "way too conservative" decision of that game, since field position isn't very important in that situation. No matter if the ball is on your own 25 or the other 25, you still have to prevent a 1st down and then drive from your own territory in order to win the game. The only tangible penalty for giving up field position is, in the event of a 3-and-out, the Cowboys probably (not definitely) kick a field goal and make it a 6 point game instead of a 3 point game. (A 25 yard TD run is probably just as damaging as a 25 yard run at the other end--both plays lead to a WP hovering near .01, and both plays are very unlikely to happen to begin with). Anyway, the difference between a 6 point lead and a 3 point lead in endgame scenarios is much smaller than it appears to most people. But if you're here, you probably knew that already. But if BB knew he'd get the ball back anyway, then maybe he was just gaming The System. I'm sure he knew that Tom Brady's offense would play for the win once they got to the opponent's 25 yard line. As a Cowboys fan, I was extremely happy the Pats were punting, but was terrified that the Cowboys would end up kicking a field goal on the ensuing drive and making it a 6-point game, thus putting the Patriots into 4 down territory until they got a TD (Brady with 3 downs to work is worrisome enough). I think the most overlooked play of the game was the 3rd and 1 QB sneak on the last drive when the Pats were on the edge of field goal position. Had Brady not converted, Belichick would have had to decide between a game tying 47 yard field goal or gambling on converting on 4th. For that matter, that was only one of three successful QB sneaks, with two of the three occurring on the Pats two TD drives. Independent George - the potential fake punt was from a different game because the punting team called a timeout coming out of the two minute warning. Furthermore, they lined up the offense, were flagged for a false start, and then punted anyway. The Raiders went for it on 4th and 1 with 4:00 to go on the Cleveland 5. It might have been the first time in history a NFL coach made a call to go for it when I would have kicked. A gimme field goal would have put them up by 3 scores with 4 minutes to go. I'm curious what other people thought. Interesting. There was 4:49 to play and they were up by 14. The numbers say kick it there. But OAK had almost no chance of losing either way. Maybe Dallas was just trying to win the time of possession battle. ._. James - ack! Well, that's what I get for watching NFL Red Zone.